Now, as a new General Authority, Elder Rex Cropper Reeve treasures the moments spent with Church leaders. At the Saturday morning session of annual general conference in April, Elder Reeve was sustained a member of the First Quorum of the Seventy. 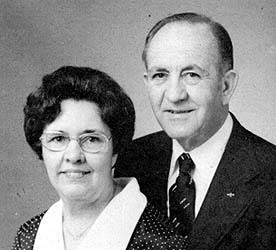 Phyllis N. and Rex C. Reeve. He was serving as president of the California Anaheim Mission when a telephone call came from President Spencer W. Kimball a few days before conference. President Kimball spoke to both Elder Reeve and his wife, Phyllis Mae Nielsen Reeve, as he extended the call. “This wasn’t the first time President Kimball had blessed our lives. He set me apart as a counselor in a stake presidency thirty years ago,” Elder Reeve says. Since then, Elder Reeve has served as a stake president, stake patriarch, Regional Representative of the Twelve, and mission president. In his church work, he has known six of the presidents of the Church. To call their influence on him “profound” is an understatement, he says. The Reeves became acquainted with President David O. McKay before they were married, when they took an evening class from him on courtship and marriage. He agreed to officiate at their marriage ceremony. They decided before marriage to have as large a family as they could and to always put the Lord and his work first. That foundation has served them well through several hardships. They nearly lost their oldest son, Rex C. Reeve, Jr., who is now director of the institute at Orem Technical College. “But we’ve been blessed,” Elder Reeve says. He speaks happily of the accomplishments of all his children﻿—including his sons Roger Warne Reeve of Phoenix, Arizona, and David A. Reeve, a law student at Brigham Young University; and of his daughter, JoAnne Reeve, who teaches at Ricks College; and of his two other daughters, Mrs. Garth (Venice) Finlinson of Oak City, Utah, and Mrs. Lane (Barbara) Nielson of Monett, Missouri; and of the twenty-three grandchildren in the family. And he speaks proudly of his pioneer ancestors, some of whom are buried along the Mormon trail.